MILLSTADT, IL (KTVI) - A mystery horse is gaining a following on Facebook. There have been repeated sightings of the horse the past 10 days. A man who's actually pet the horse says it appears to be 2-3 years old and it's a male. The horse has been spotted repeatedly near Imbs Station and Wagner Roads in rural Millstadt in St. Clair County. A Facebook post Wednesday has video from one of the last sightings in a bean field at Wagner and Otten Roads. Dave Sickinger can see that bean field from his front yard. He didn't have to look that far to see the horse 10 days ago. His home security camera captured video of the horse in his front yard. The video shows the horse took exception to a pesky fly on his rear, trying to buck if off when the horse's tail wasn't enough to do the job. Otherwise the horse seemed gentle as Sickinger and a sheriff's deputy tried to figure out whose horse it could possibly be. A mystery horse is gaining a following on Facebook. There have been repeated sightings of the horse the past 10 days. "We were talking -- the horse came right up to me," Sickinger said. "I petted him. Fed him grass. Then a tandem dump truck come driving down the street. The horse actually chased the dump truck." Sarah Wilderman saw the horse in the middle of the road as she was passing through last week. She's concerned that as the horse wanders through the bean fields along the nearby creek, he will encounter drivers and drivers will encounter him. She's called the sheriff's department, too. "He was standing in the middle of the road and being a dark horse, there's a lot of semis coming, I was just afraid he was going to get hit and him get hurt or a motorist get hurt or something like that," Wilderman said. "Somebody should be wanting that animal back. He's probably worth quite a bit," Sickinger said. Sickinger and Wilderman have checked with nearby horse owners. He doesn't belong to them, they said. 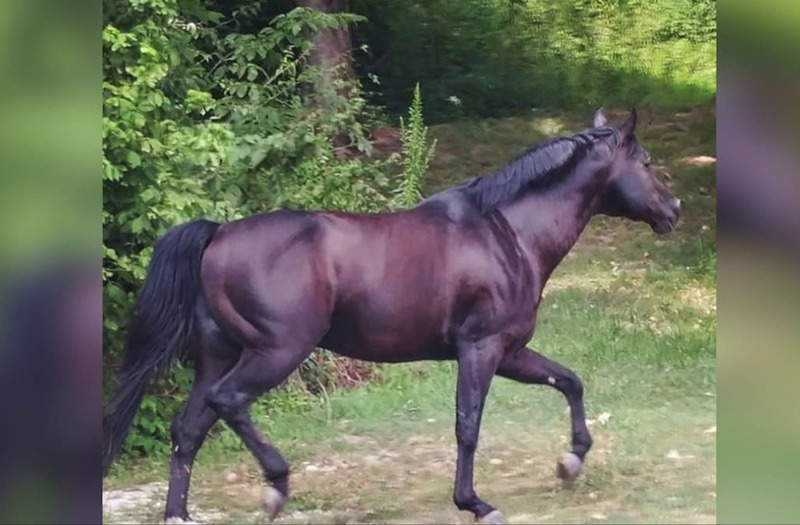 If you see him or know anyone missing a horse, call the St. Clair County Sheriff's Department.